Gary Gill (by Craig Stoddart). There are now several divisions separating Darlington and Blackpool, but in 1990 Quakers won at the Tangerines to continue their terrific start to what proved to be a fine season. Gary Gill’s fourth goal in nine appearances gave Brian Little’s side a 2-1 victory at Bloomfield Road during a run in which Quakers lost only two of the first 14 matches. Hartlepool inflicted the third defeat at Feethams, and Gill is pictured on the mudbath at Victoria Park in a 0-0 draw during what became a Division Four title-winning campaign. 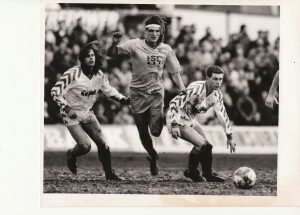 Also pictured is Pools’ equally long-haired Steve Tupling, left, and John Tinkler. Played on February 23rd of the of 1990-91 campaign, there were 6,100 in attendance for a match that is remembered for Mark Prudhoe’s outstanding display which earned the goalkeeper 10/10 in the following Monday’s The Northern Echo. Gill ended the season with eight league goals, making him joint second-top scorer with David Cork. John Borthwick scored ten. Having dropped from First Division Middlesbrough to join Darlington, Gill left in February 1992 to join Cardiff City, but injury cut short the box-to-box midfielder’s career. For a brief spell he was manager of Gateshead and he is now working for Middlesbrough.